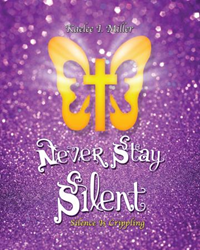 Kaelee I. Miller’s new book, Never Stay Silent - Silence Is Crippling, ($13.99, paperback, 9781498465021; $6.99, e-book, 9781498465038) graphically recounts the author’s devastating journey filled with repeated molestations and rapes – a story from childhood to adulthood – from hell and back. These sickening experiences and her disastrous relationship with her abusive mother caused her to spiral down into the deepest depression, self-mutilation, promiscuous relationships and drugs. She was so caught up in fear and anger that she remained quiet and allowed the abuse to continue. However, God found her at her lowest points and provided her hope for the future. By sharing her life experiences, she shows the different ways Christianity and God entered her life – at camp, through friends and at church – to demonstrate how God was continually reminding her of His love and grace during her most difficult challenges. His constant presence in her life will be easily recognized through each chapter of the book and how it guided her back to Him. Kaelee is speaking out through this book to prove to other abuse victims that staying silent is the essence of mayhem for the mind ... it only allows the evil of darkness to continue. She reminds readers that abuse is WRONG and the victim is NOT at fault. Kaelee I. Miller does not consider herself a professional but she does consider herself an expert in being patient. Experiencing abuse for so many years, she has learned a large amount of information regarding abuse. She hopes that her message to other abuse victims regarding “speaking up” should provide them the courage to speak out and find someone to listen. Despite Kaelee’s troubled past, she is still hopeful for a wonderful future. Kaelee concludes her book revealing her long-term goals to pursue nursing and to one day begin a family with the right, godly guy. Xulon Press, a division of Salem Media Group, is the world’s largest Christian self-publisher, with more than 15,000 titles published to date. Retailers may order Never Stay Silent - Silence Is Crippling through Ingram Book Company and/or Spring Arbor Book Distributors. The book is available online through xulonpress.com/bookstore, amazon.com, and barnesandnoble.com.